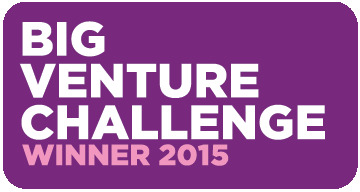 We are very proud to announce that Little Forest Folk will today be declared a winner of the Big Venture Challenge. The Big Venture Challenge is a UK wide competition sponsored by the National Lottery to find the UK's best social entrepreneurs to provide them with support to scale up their venture to offer similar social benefits to a wider audience. When we entered we had only been open for one month, so we didn't expect to get far in the competition but luckily a canny judge recognised we were worth looking into further so we were invited to the quite terrifying Dragon's Den style pitch final. Being more used to making mud pies than powerpoint presentations it was a challenge for us but our passion for our subject and the overwhelming evidence for the benefits we are providing for our children managed to win over the 8 (!) judges who recently judged us to be the winner of the competition. The judges particularly loved the fact that due to our close monitoring of their development, we can measure the success of our nursery by demonstrating with accuracy the incredible development in a short time of our children's fitness levels, coordination, mental development and general learning. This morning we are off in our finest togs (no mud crusted wellies today) to a day long event during which the competition results will be announced to the media. As loyal supporters of Little Forest Folk we wanted to both thank you for your support in helping us get this far and also let you be the first to know our exciting news! We look forward to sharing lots more exciting developments at Little Forest Folk with you all soon. And in the meantime we are simply enjoying the sensation of being recognised by a very experienced panel of judges as being one of the UK's most impressive social entrepreneurs. Exciting stuff when we opened this nursery almost entirely to realise the dream childhood we aspired to for our children....!